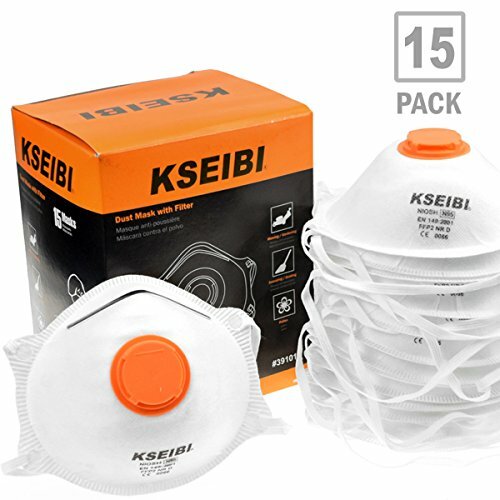 KSEIBI Respirators help protect your lungs from harmful vapors, fumes, gases and dust particles which could lead to more serious health complications. Equipped with elastic banding, our Respirators negate any potential latex allergic reactions from occurring. We offer our Respirators in quantities that are suitable for a single individuals demand or the demands of a large company. N95 Certified Disposable cupped dust masks with high performance exhalation valve. Soft inner face seal for added protection. Wide adjustable straps for comfort. Nose clip for adjustment to ensure a good fit. Exhale valve reduces hot-air buildup, keeping workers cooler.